On the anniversary of Raoul Wallenberg’s disappearance, The International Raoul Wallenberg Foundation is organizing a series of events and has contacted other factors which, as a consequence decided to commemorate the legacy of the Swedish diplomat around the world in January. Inauguration of the commemorative plaque at the train station Jozsefvaros, organized by the IRWF and the Raoul Wallenberg Association of Hungary, following an initiative of Martin Sugarman – Budapest. Holocaust Remembrance day and Raoul Wallenberg Commemoration, organized by Maria Martha Fernández volunteer of the IRWF – Madrid. Commemoration at Bet-El synagogue following a suggestion made by the IRWF -Madrid. President, Mr. Salomon Benzaquen Cohen, following a suggestion made by the IRWF. Commemoration at the Israeli Community of the Asturias Principality by Nataniel Castano, following a suggestion made by the IRWF. Commemoration at the Call Asociation of Barcelona by Miguel Iaffa, following a suggestion made by the IRWF. On Saturday 14, a Shajarit religious service took place in Barcelona in homage of Raoul Wallenberg. Raoul Wallenberg and Day for the Victims of National Socialism Commemoration at Vaterunser-Krischengemeinde organized by Pastor Annemarie Werner – Berlin. Berlin-Marzahn District Government will add a sign to the Raoul Wallenberg Street that reads, ”Raoul Wallenberg / Swedish diplomat / Saviour of thousands of Hungarian Jews / 1912 – ?” – Berlin. Wallenberg Commemoration organized by Jill Blonsky, volunteer of the IRWF and with the presence of Sir Sigmund Sternberg – London . Activities at the Raoul Wallenberg School, organized by the IRWF – New York. Commemoration at Ohev Tzedek – Congregation Sha’arei Torah by Rabbi Joel Berman, following a suggestion made by the IRWF – Boardman OH. Commemoration at the Edmond J. Safra Synagogue by Rabbi Elie Abadie, M.D., following a suggestion made by the IRWF – New York. Renaming of Veterans For Peace Michigan Chapter 93 after Raoul Wallenberg organized by its coordinator Bob Krzewinski – Michigan. Commemoration in the radio program Shalom Israel by José Weiss, Holocaust Survivor saved by Raoul Wallenberg, and Mr. Glanz – Miami. Commemoration in honor to Raoul Wallenberg at The Village Temple, Congregation B’nai Israel of New York City, by Rabbi Chava Koster, following a suggestion made by the IRWF. Reading about Raoul Wallenberg’s life at the Mincha service that opens the Hebrew School session of First Hebrew Congregation of Peekskill, organized by Rabbi Claudio J. Kupchik – Peekskill. International Rescuer Day organized by Larry Pfeffer – Jerusalem. Commemoration at the Kehilat Mevasseret Zion by Rabbi Maya Leibovich, following a suggestion made by the IRWF – Mevasseret Zion. Commemoration at the University of Tel Aviv by Samuel Leillen (friend of the University of Tel Aviv of Spanish language) – Tel Aviv. Commemoration at the University of Tel Aviv by Prof. Dina Porat (Head The Stephen Roth Institute for the Study of Contemporary Racism and Anti-Semitism) – Tel Aviv. Seminar at the Center for Jewish Studies of Nanjing University, organized by the IRWF representative in China, Professor Xu Xin Professor of Jewish Studies, University of Nanjin. Hong-Kong: Ms Abigail Tenembaum, Vice President of the Wallenberg Foundation attended a service at the Synagogue of the United Jewish Congregation. Invited by Rabbi Michael Schwartz, Ms Tenembaum delivered a speech that paid tribute to Raoul Wallenberg and called for this January 17th to be the last year when Wallenberg is commemorated as missing. Ms Tenembaum also announced the imminent opening of an IRWF representation in China in cooperation with professor Xu Xin. Commemorative ceremony at Raoul Wallenberg Monument organized by the IRWF – Buenos Aires. 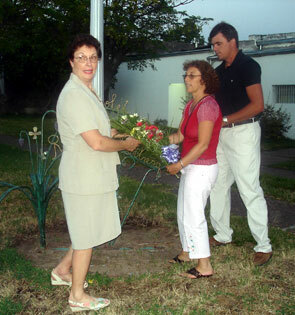 Commemorative ceremony at Raoul Wallenberg Park in the city of Moises Ville, in Santa Fe Province, headed by Mrs. Eva Rosenthal, Director of the Arón Goldman Historical Comunal Museum. Commemoration at the Jewish Community and the EUJS, organized by Andrei Schwartz, following a suggestion made by the IRWF. Jewish Communitary Center of Paris: ceremony in honor of Raoul Wallenberg on January 18 with the presence of Avi Pazner. Commemoration at the Jewish Students Union of France organized by Franck Waserman following a suggestion made by the IRWF. Tribute to Raoul Wallenberg at the St. Kilda Town Hall. The Mayor of Port Phillip addressed the gathering, followed by Professor Andrew Markus, Head of Jewish Civilization at Monash University. He gave an account of the historical context of the events in Hungary 1944-5, and recalled the experiences of his mother, who survived in Budapest. Frank Vajda, survivor saved by Wallenberg, presented a series of vignettes related to some personal experiences and events involving Raoul Rallenberg and his heroic, insightful, compassionate and brilliantly decisive actions in contributing to the survival of the largest Jewish community remainig in occupied Europe – Port Phillip. Luncheon in honor to Raoul Wallenberg organized by John Backhuys-Toorenburg – Melbourne. Tribute to Raoul Wallenberg and his heroic actions in Raoul Wallenberg School – Babahoyo. Raoul Wallenberg commemoration in a special ceremony at the Agudath Israel Synagogue, organized by Jim Scharfstein – Saskatoon. The city of Saskatoon honors Wallenberg by renaming, for one week, the portion of McKinnon Avenue where the synagogue is located as Raoul Wallenberg Boulevard – Saskatoon. Event Commemorating Raoul Wallenberg at the Wallenberg plaque unveiled in Queen Elizabeth Park in 1986 – Vancouver. 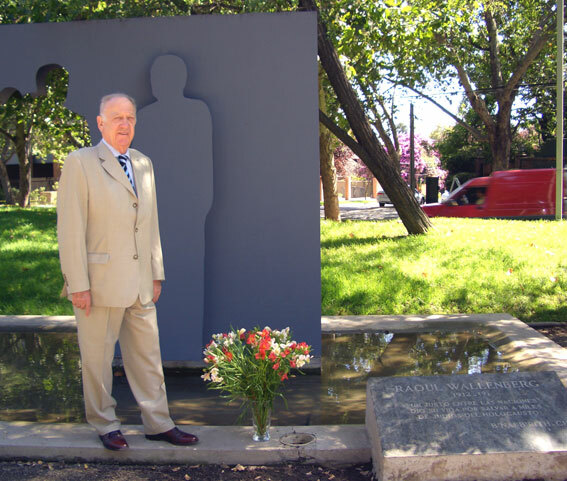 Flowers were placed by Mr. Amikam Doron before the monument built in honor of Raoul Wallenberg in Chile – Santiago de Chile.